In the past few years, the field of exoplanet discovery has really taken off. Instruments like Kepler and the newer TESS have been racking up the planet count, with almost 4,000 exoplanets confirmed to date. But this week, astronomers writing in the journal Science Advances up the ante—describing the possible discovery not of an exoplanet, but of a Neptune-sized moon orbiting an exoplanet known as Kepler-1625b, some 8,000 light years away. Alex Teachey, co-author of the paper and a graduate student in astronomy at Columbia University, joins Ira to talk about how the observations were performed, and the challenges of the hunt for exomoons. Correction: A previous version of this article incorrectly stated Kepler-1625b’s distance from Earth. 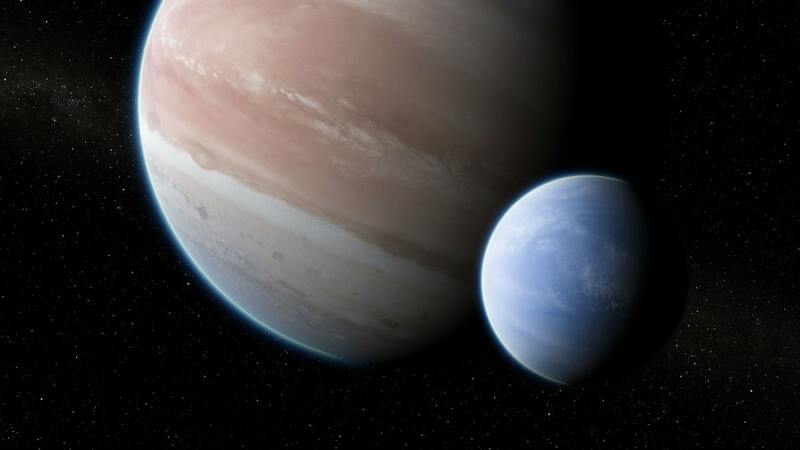 Science Advances, AAAS: Thanks to Help from Hubble, The First Confirmed Exomoon? Alex Teachey is an NSF Graduate Research Fellow in the Department of Astronomy at Columbia University in New York, New York. IRA FLATOW: This is Science Friday. I’m Ira Flatow. In the past few years, the field of exoplanet discovery has really taken off. Instruments like Kepler and the newer tests had been racking up the planet count. But this week, astronomers, writing in the journal Science Advances, brought the whole thing to a new level, describing the possible discovery, not of an exoplanet, but of a moon orbiting an exoplanet, to be specific, Kepler-16-25-b, that is some 4,000 light years away. How did they do that? Well, joining me now to talk about the research is Alex Teachey. He’s an NSF graduate research fellow in the Department of Astronomy, right here in New York, at Columbia University. Welcome to Science Friday. ALEX TEACHEY: Thank you very much for having me. IRA FLATOW: First, what moon is this? Where is it? Give us a little thumbnail description. ALEX TEACHEY: Sure, yeah. So it’s a moon, as far as we can tell. We’re not quite claiming it as a discovery yet. There’s still some lingering uncertainties. But as far as we can tell, it’s there. A large moon, about the size of Neptune actually, which is sort of strange, orbiting this planet called Kepler-1625-b. And it’s about 8,000 light years away, as far as we can tell. IRA FLATOW: So what is the relationship of the size of the moon to the size of the planet? ALEX TEACHEY: So the size of the planet is about the same size as Jupiter. It’s a little more massive, as far as we can tell. And then the moon is, like you say, about the size and the mass of Neptune. IRA FLATOW: But isn’t that pretty unusual, a moon that big? ALEX TEACHEY: Well, it’s certainly unexpected. If you look at the moons in our solar system, we’ve got a lot of them. They’re all significantly smaller than the Earth. So when we spotted this, we said, this is what it looks like, about the size of Neptune. That sort of raises new questions for people. How do you get something that big? It’s a little premature to say how common or how rare something like this might be because this is potentially the first. So we don’t have any sort of population statistics on these things. But you could argue that because it is the largest– because it is so large, it’s sort of the lowest hanging fruit. So maybe it’s not entirely surprising that the first one we see is so large. IRA FLATOW: You know, because when we think of our Moon, we think of another body hitting the Earth and knocking out a piece of it. It doesn’t it look like that, in this case. ALEX TEACHEY: Ah, yeah. So there’s basically three mechanisms that we think will get moons from, an impactor scenario, like how we got Earth’s Moon; moons coalescing out of a disk of materials swirling around the planet in the early days of the planetary system, like the way we get the moons out of Jupiter, and Saturn, and Uranus; and then, finally, a capture scenario, like Neptune’s largest moon Triton. As far as we can tell that was captured from the Kuiper Belt. So this is sort of the first question that everybody thought of when we announced this large moon. How do you get something like that? It’s not necessarily ruled out by known mechanisms. But it certainly has the theorists scratching their heads a little bit. IRA FLATOW: Yeah. Yeah. We like it when they scratch their heads. How do you detect a moon? I know the theory about detecting a exoplanet is it– well, you tell us how it’s found. ALEX TEACHEY: Sure. Yeah. So there’s a variety of ways to go about looking for planets. But the most popular, the most successful way so far, is using this thing called the transit method. When the planet passes in front of the star from our point of view, it blocks out just a little bit of the starlight that we’re observing. So if you’re monitoring the brightness of the star over time, you see a little dip in the intensity of the starlight. If there is a moon around that planet, then we would expect a big dip from the planet and then a smaller dip as the moon blocks out some of the light as well. In addition to that, we try to see gravitational influence of the moon on the planet. The planet, of course, is pulling on the moon. But the moon is pulling on the planet. And so that makes the planet wobble around a bit as it orbits the star. And so sometimes that planetary transit comes in early. Other times, it comes in late. And so those are really the two lines of evidence that we see for this exomoon. Not just this dip, this transit of the moon. But also something pulling on this planet, that we are attributing to the moon. IRA FLATOW: Yeah. And that’s the point I want to pick up on. Because when you came in and talked about it, you said, well, this is the evidence. But we’re not totally sure. IRA FLATOW: What is the doubt that we have? ALEX TEACHEY: One of my favorites. Extraordinary claims require extraordinary evidence. So we’ve done what we think is a pretty thorough and rigorous job, trying to rule out other possible explanations for this signal. The question naturally comes out, is there something weird going on with the telescope? Is this maybe something happening on the surface of the star? Could there be another planet in the system that’s pulling on this planet and making it wobble around? Those are all plausible explanations. But we’ve done our best to rule out those alternative explanations. ALEX TEACHEY: Maybe incredible is not quite the right word. It’s an extraordinary claim. And so we really think additional observations of the system are needed to really confirm it. IRA FLATOW: Well, it was so unusual. I’m reading from my notes here that you were able to get viewing time on Hubble for this. IRA FLATOW: It’s very hard to get. So other people must want to know about this. ALEX TEACHEY: Sure. Yeah. Yeah. So we had observed three transits of the planet in the Kepler data. This was a phenomenal mission, that lasted about 4 and 1/2 years. We saw three transits with Kepler. They looked tantalizing. But it wasn’t enough to make a claim. So we really thought at that time we needed to follow up and observe this thing again. Hubble was really the only game in town. It’s a very long duration event. We observed the system for about 40 hours altogether. So if you think about it, the Earth is turning. And so you can’t observe this system with any single telescope from the surface of the Earth. So you’d have to stitch together multiple data sets, from multiple telescopes, to make this observation. And that would be very challenging. So you really have to go to space. And obviously, we made a convincing enough case that they gave us the time. IRA FLATOW: And what? They’re talking about once the Hubble is gone– and I don’t know why it should be. But that’s not for me to determine. It’s going to be used up. The Webb Telescope, is that better for you guys, who are looking at exoplanets? IRA FLATOW: Tell us why. ALEX TEACHEY: Yeah. It’s going to be a spectacular instrument. It’s a very, very large mirror. And whereas Hubble orbits the Earth, when we perform this observation, you can imagine Hubble staring at this target. But then the Earth gets in the way for about 45 minutes every single orbit. Hubble takes 96 minutes or so to go around. So half of that orbit is just totally blocked out. JWST won’t have that problem. And, like I say, the mirror is going to be really spectacular. So that data is going to be phenomenal. The bigger problem is that these observations, as I mentioned before, are so long that you need a lot of time to perform them. And this telescope is going to be highly oversubscribed. Many more people want to use it than they can possibly for the time. So we’re going to have to have a very good case for the observation. IRA FLATOW: Obsolete is the wrong word. Everything is always obsolete by the time it gets built. Whether it’s a highway or something else, it takes so long. They say, we should have made it twice as big. We should– whatever. ALEX TEACHEY: Sure. Yeah. So there’s other telescopes coming down the pike. There are people bidding right now to– well, we’ve talked about WFIRST. And then there’s a telescope called LUVOIR. ALEX TEACHEY: I don’t know who’s working on it. But it’s ultraviolet, and infrared, and optical. That’s L-U-V-I-O-I-R.
IRA FLATOW: Oh, I see. I see. ALEX TEACHEY: So they come up with great names for these things. So there’s going to be some fantastic instruments. JWST will definitely be an improvement on Hubble. But Hubble is over 25 years old now. And it’s still a top-of-the-line instrument to use. It’s really amazing. IRA FLATOW: It is. So if this is a strange star-planet situation, does it– can it tell us anything about our common, ordinary solar system, planet situation? ALEX TEACHEY: That’s a great question. One of the things that I am always saying to people is– they always come with the question, why do we care about these moons? What’s interesting about these things? And I think a big part of it is that every time we look out at these exoplanetary systems, we are learning by extension more about our own solar system. And the question is very much still open, how common are we? The things going on here, happened in a billion, 100 billion other places across the Milky Way? Or is it a very uncommon chain of events that led to us here? And that, of course, speaks directly to the question about the origin of life, for example. So particularly since this moon is raising new questions about how you get something like this, it’s opening up some new questions about the dynamical histories of these planetary systems. And this speaks directly to that question. IRA FLATOW: And the more exoplanets you discover– what, thousands of them? ALEX TEACHEY: Yeah. About 4,000 confirmed planets, I think, at this point. IRA FLATOW: The more questions you’re going to open, rather than get answers possibly? ALEX TEACHEY: Well, yeah. That’s a good enough number into that, that we’re now really filling in some nice statistics. But there have been surprises along the way. We found these things called hot Jupiters, planets about the size of Jupiter, but very, very close to their star. Nobody really expected to see these things at all. And even 20-some years after their first discovery, the theorists are still debating how you make these things. IRA FLATOW: I saw a story today, just in passing– I don’t have any details– about a new exoplanet that’s too big. It shouldn’t be as big as it should be, right? It should have been in the junk that’s accumulated. ALEX TEACHEY: I may have missed that one. I’ve had a busy week. Sometimes they’re very inflated. IRA FLATOW: Very inflated. Well, thank you very much, Alex. ALEX TEACHEY: Thank you very much. IRA FLATOW: Alex Teachey is an NSF graduate research fellow in the Department of Astronomy at Columbia University.